Most Northwest Coast Art is abstract to a greater or lesser extent, of course, in that it is highly stylized and uses a number of basic shapes not found in nature to achieve its effects. However, the sub-genre specifically referred to as abstract is less naturalistic than most. In an abstract piece, some of the distinguishing features of a subject are often missing or distorted and often only one or two remain. The figure is further distorted by the surface it is on. The end result is a figure far removed from the semi-naturalistic figures in the tradition – so much so that viewers either need the title or some familiarity with the art in order to know what is being depicted. These conditions open up possibilities for original self-expression that are often harder to find in semi-naturalistic figures. What is left is mostly teeth and claws, creating an impression of fierceness, especially since the claws are outsized. This impression is strengthened further by the elaborateness of the eye with its tilt, as well as the red of the tail bisecting the image. Technically, the print might be called a study in threes. Three parts of the wolf – the head, the tail, and the foot – are depicted. There are three black ovoids — the eye, foot and nostril – that frame the image, each with a slightly different shape as well as different interior decorations. In addition, three parallel lines –the tail itself, the bottom line of the heat and the top of the foot – cut across the picture. Three black lines form the foot, although only part of the two claws are parallel. In addition, the eye is made elaborate by three clusters of U-shapes, each with some variation of a T-shape inside it to thin it out. For variation, the patterns of three are sometimes broken, as in the red decorations around the eye, only two of which have a tripartite structure, but the grouping are enough to give the figure of “Wolf” a strong unity. An especially interesting cluster of threes is the tail with its knick in the middle. It is minimalistically echoed in the thin red line beneath the claws, and in the mirror image that touches the ear on one side and the muzzle on the other.. I am not absolutely sure of Wilson’s intention, but the way that the top structure mirrors that of the tail suggests to me that it is part of the tail, so you have to imagine the tail wrapping around the wolf, stretching from the bottom of the image to the top behind the figure, where you can’t see it. The formlines, too, are worth pointing out. For much of their lengths, they are a uniform thickness, and bend at almost the same angle. However, they are saved from being monotonous by their long, tapering ends, and surprisingly few other techniques. Instead, they create a sense of boldness that seems to fit with the ferocity of the wolf. In fact, if I had to use one word for “Wolf,” that word would be “bold.” In a way, I regret that the print is so small, because “Wolf” is a design that almost demands to be blown up for a house-front or some other large-scale depiction. 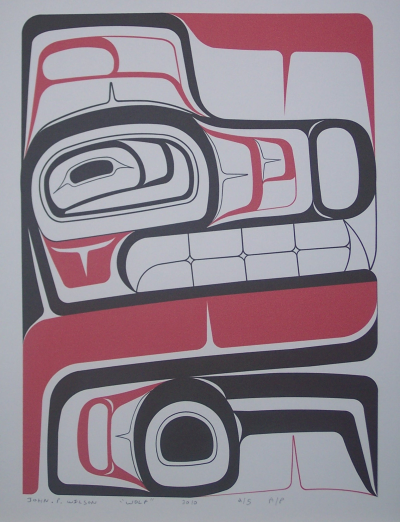 Northwest Coast art is semi-abstract to begin with, and continues to have a strong tradition. For these reasons, abstract or post-modern work in the field is rare. Perhaps the best-known movements in those directions come from Michael Nicoll Yahgulanaas’ Haida Manga or Andrew Dexel (Enpaauk)’s graffiti-inspired canvases. However, long before either of these efforts, Doug Cranmer was making his own movements towards abstraction or post-modernism. In the mid-1970s, he did a series of abstract paintings, several of which were turned into limited edition prints in 2005, and some of which have been released to a handful of galleries in the last month. Recently, we were privileged to take home a print of “Ravens in Nest,” which is compositionally the most interesting of the recently released prints. At first, the idea of abstracts coming from someone like Doug Cranmer seems unlikely. After all , Cranmer comes from the first generation of artists in the Northwest Coast Renaissance, have learned carving from Mungo Martin. Later, he worked with Bill Reid on poles and houses that were commissioned by the University of British Columbia. And in the mid-Seventies, who else was doing abstracts? Back then, even Bill Reid had just completed his mastery of traditional form and had yet to edge towards the free-form works of his last period. It would be almost two decades, too, before Robert Davidson would become one of the best known artists to move towards abstraction and post-modernism. However, in an interview excerpted on the Museum of Anthropology web page, Cranmer explains that he was reacting against the orthodoxy created by Bill Holm’s book Analysis of Form, the first to codify the basic elements in Northwest Coast art. If you look at “Ravens in Nest,” you can see this anarchistic outburst very clearly. The classic formline of Northwest Coat art barely puts in an appearance in the print. Instead, that flexible container of design elements which is generally black, is replaced by a thick red border. Perfect circles replace ovoids. U-shapes, unusually colored blue, float freely across the top, changing direction on each line, and change shapes along the bottom. Blue and red are the main colors, not black. The expected curve of the young ravens’ beaks – an identifying element of a raven in the traditional art — is reduced to the slightest tip possible Instead of the classic symmetry, everything is decidedly unbalanced. 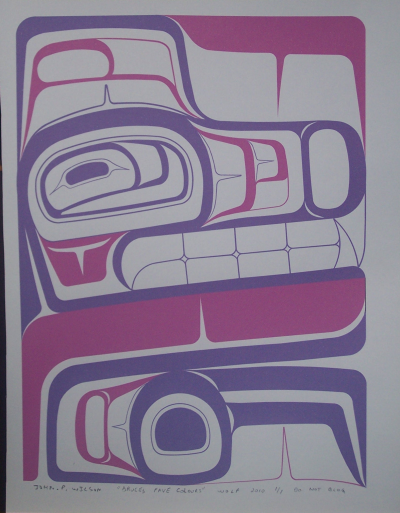 You might almost say that “Ravens in Nest” is a Northwest Coast print because of all the things that it does not do. Like early post-modern works, the print works to the degree that you know the tradition that it is reacting against. Furthermore, the more you do know, the more what Cranmer has done makes you think about traditional Northwest Coast forms. In fact, while Cranmer may have been reacting against orthodoxy, what he has produced is just as dependent on tradition as any piece that carefully follows the norms outlined by Holm. The only difference is that “Ravens in Nest” is dependent on tradition as its polar opposite, rather than as a key to its technique. At the same time, while you can easily intellectualize about the piece, its subject remains clear: four hungry and clamoring young ravens. I don’t know if Cranmer intended the effect, but the floating U-shapes seem a graphical representation of the sound they are making, chaotic and clashing. Such paintings were only a momentary experiment with Cranmer, but they had few if any imitators. The result is that the prints still offer a unique and challenging perspective thirty years after the original paintings. I am not fond of the average abstract, but in Cranmer’s I see a bold and innovative exception that I am proud to hang on our wall.